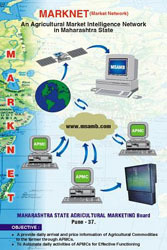 MARKNET is network of computerised APMCs in the State. Under this project, the state marketing board has computerised APMCs and connected through internet. To exchange and disseminate market arrivals and prices of Agricultural commodities, for the benefits of farmers. To bring the effectiveness and transparency in the functioning of APMCs. Presently 294 main APMCs and 66 sub yards have been computerised under Marknet Project. All 360 computer sets have been provided to APMCs free of cost under AGMARKNET scheme of Director of Marketing & Inspection, Govt. of India. Each computerised APMC has one computer, UPS, modem, printer, and internet facility. Daily arrivals and prices data is being entered into the computer at APMCs and uploaded on the MSAMB's website (www.msamb.com). Data uploaded on the web site is compiled and made available through web site to every body. MARKNET has created awareness about daily arrivals and prices of Agricultural Commodities. The arrival and price information of Agricultural Commodities of other markets is made available to farmers through this Market Network. APMCs could avail email and Internet facilities. Due to email information exchange has became faster and economical. Agricultural Information is accessible at APMCs through Internet.